This easy-to-sew, easy-to-wear afternoon dress from about 1920 flatters any figure. 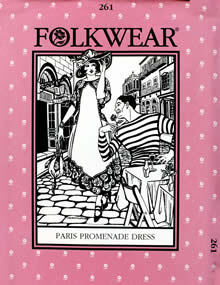 Pullover dress is attached to bib-shaped overdress, then shaped to the body at the waist by a self-fabric sash or purchased decorative cord. Vintage-style drawstring handbag completes the look. Pattern includes instructions for making decorative tassels to attach at ends of dress sleeves and bottom of handbag. Misses Extra Small to Extra Large.